Daniele De Rossi One Transfer Too Much for Man City | The Transfer Tavern | Where football transfer rumours fly or die! With sixteen goals conceded from thirteen games and only twenty-three scored, it has become clear Manchester City are struggling to defend the title. Their lack of defensive ability appears to be costing them vital points that their rivals are beginning to pick up. 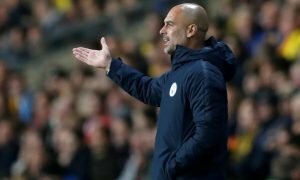 Just this time last year, City were unbeaten in the first ten matches and had an impressive record of thirty-eight goals scored to the eight against. Into the new campaign, with only nine goals let in, the table may look pretty favourable to all Citizens fans yet with the Champions League involvement, Roberto Mancini seems to be struggling. His tactical nous has come under fire after a poor switch to 3-4-3 when losing 2-1 to Ajax. The third goal from the Dutch side elaborated the bad decision from the Italian manager. The previous games in the European competition have seen Man City concede four goals in two games, one of which was an incredibly fortunate draw against Borussia Dortmund. Many fans have chalked this down to the departure of Nigel De Jong, a no-nonsense defensive midfielder who provided cover for the attacking side of Yaya Toure. With no real replacement for the strength and character of De Jong during the summer, the January transfer window sees an opportunity for Mancini to buy someone of a similar role. Daniele De Rossi. The Italian has impressed since the beginning of his career with Roma as he spent twelve years with the Serie A club. The ‘one-club-man’ became the highest paid Italian (Goal) after extending his contract in February earlier this year. But the real question remains. Are Manchester City willing to pay over the odds for a 29-year-old? And is he really necessary? 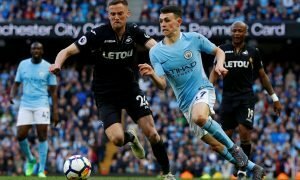 The concession of goals has become a worrying sight for City, especially in the Champions League but is it the acquisition of yet another defensive midfielder that will help the cause? Javi Garcia’s £16m move from Benfica has barely passed two months and with the likes of Gareth Barry, James Milner and Jack Rodwell in the mix too, just how many midfielders do the Sky Blues want? There are many tales of the English Premier League being the most intense and demanding of all European leagues and with players coming from different countries, some players have to go through the ‘adaptation period.’ With De Rossi a tough-tackling midfielder, just how quickly will he settle into the pace of the EPL? And at 29, does he have the legs for it? Garcia was signed as an alternative option by Mancini and since then, the Spaniard has made the role his. At 25, not only is the former Real Madrid man at his peak but he provides a long-term preference that should be embraced, not hindered. Ultimately, it’ll be up to the man in charge to make a decision but with Financial Fair Play in effect, and with De Rossi on a longstanding contract, maybe Mancini will do well to let this transfer go.